Torn tires can leave you with the deflated feeling. Be sure to boot these tears or risk a blowout. After thinking over what happened to my tire, I’ve concluded it was my fault! There’s no way a rock could cause these slashes and I haven’t had any sticks caught in my tire. I do recall though opening a door at work and the door bottom with its sharp edge rubbing the tire, maybe on two occasions. Slice. Tire cords can withstand enormous pressure, but they’re delicate strands when it comes to sharp edges. That’s not to say a rock can’t break cords, or a stick. 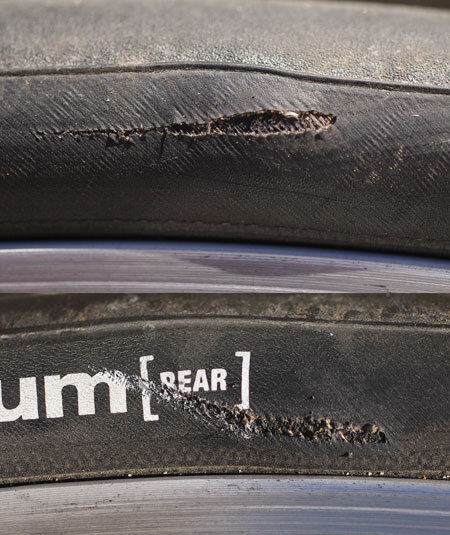 A few weeks ago, riding on Highland Way–not the smoothest road in the Santa Cruz Mountains–Charlie Kempner hit a rock (I heard it “ping!”) and it not only cut the cords on his fancy new 23mm tire, it gouged the rim! The best minds in cycling have debated what causes these cuts on Rec.bike, including Sheldon Brown and Jobst Brandt. While I may be at fault, I think the Michelin sidewalls are less durable than others, but some say that supple style gives a better ride. The Continentals seem to have the best sidewalls. This entry was posted on June 25, 2012 at 8:31 pm and is filed under Products. You can follow any responses to this entry through the RSS 2.0 feed. You can leave a response, or trackback from your own site. Ray, try these Schwalbe Ultremo DD tires. They’re fast, last decently long, come in 25c and have good flat protection which includes sidewall protection. They’ve worked very well for me this year.